We are in the midst of historic week of cold in Madison, with wind chills potentially dropping to 50 below Wednesday morning. Classes, events, and campus activities are cancelled until noon on Thursday, but it is still important to understand the danger of this extreme cold and to take advantage of resources available through the university and the local community. Stay updated on Campus Alerts, and most importantly, take care of each other and yourself. Below are some tips and information from campus partners about staying safe during harsh weather conditions. This weather is unprecedented, so please consider this information seriously, and take appropriate precautions. In wind chills of 40 to 50 below zero, frostbite can occur on exposed skin in just ten minutes. It’s important to stay indoors as much as possible to avoid risk of injury. If you do need to venture outside, dressing in layers that leave no skin exposed. Layers help protect and insulate you from the cold. Review the list of services that will remain open while campus is closed. The Dean of Students Office can provide support and resources. Call 608-263-5700 or email dean@studentlife.wisc.edu for non-crisis related issues, and someone will respond to you when the university reopens. If you’re experiencing an emergency, please dial 911. If taking the bus, it is recommended to plan extra time for your commute in the case of delays and be prepared to be flexible and patient with tips and resources from the City of Madison. 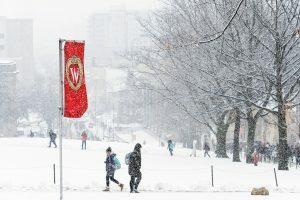 According to local news sources, several shelters and locations in Madison will be open for extended hours during the cold. Review the full list. If you need information about inadequate heat in a rental property, for social service agencies that provide services for a variety of individuals in Madison and Dane County, or for more winter safety reminders, please visit the City of Madison website. Please report accessibility concerns and support members of our community. Did we mention you should visit alerts.wisc.edu for campus related alerts? Stay warm and safe. And remember, take care of one another. It’s what Badgers do.